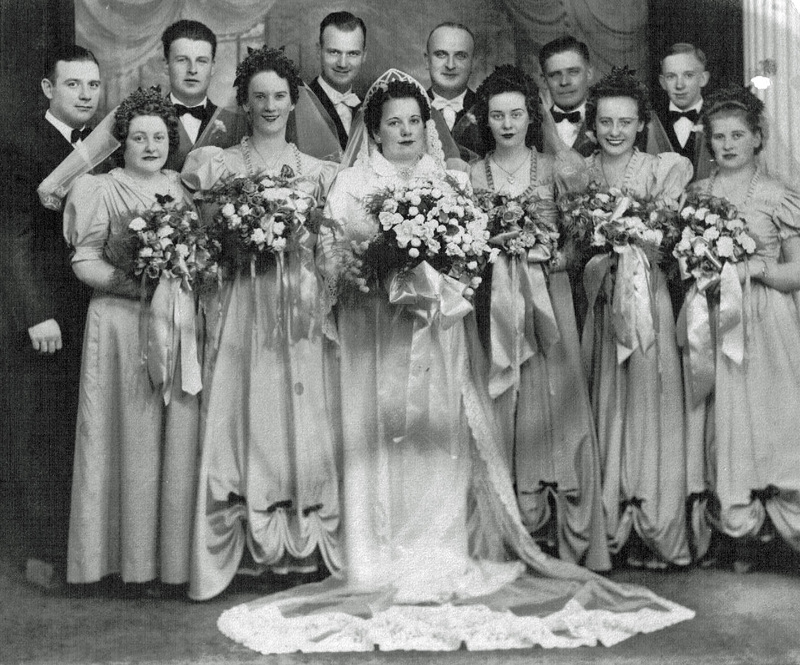 Wedding of Bernice Andruskevitch and Charles Robert Moser. William Joseph Shaudis, second man from left. 1940. Bernice and Charles had three children: Ronald, Delores (Moser) Brazier and Rose Marie (Moser) Richardson, mother of Donna Richardson Baker. Rose Marie Moser married Larry Richardson of Springfield, and the couple had nine children. Donna is second oldest of the nine, and has her own three children: Christopher and Nick Richardson and Kourtney Baker, a student at Sacred-Heart Griffin High School, and several grandchildren. Donna is secretary of the Lithuanian-American Club of Central Illinois, and her aunt Delores is a member of the Club. Both Anna Shoudis’ wedding to Joseph Andruskevitch, and Bernice Andruskevitch’s wedding to Charles Moser, took place at St. Vincent de Paul Lithuanian Catholic Church in Springfield. The weddings of Rose Marie Moser and Larry Richardson, and that of Delores (Moser) Brazier, also took place at St. Vincent de Paul’s. My grandmother was so beautiful-still miss her immensely. I’m glad we can share her beauty with so many others. The wedding photo really turned out great! My father, Wm. Joseph Shaudis, is the 2nd man from the left. Carol, thanks for finding your father and identifying him for us. Was he a World War II vet? I am also collecting those names. Please read around the blogsite to see if you dad is in any other photos, and let me know! Two of the murals from St. Vincent de Paul's Catholic Church have resurfaced. Take a look! Questions or comments? Please e-mail sandybaksys@gmail.com.